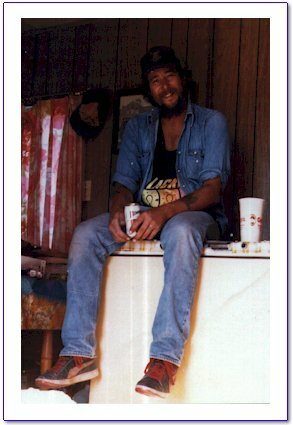 Near midnight on May 4, 2000, 46 year old Sam Lott, a Vietnam veteran was shot in his home in Tierra Amarillo, New Mexico as a result of a drive-by shooting. The assailants apparently started a fire in a new home that Lott was building on his property about a mile east of U.S. 84 on U.S. 64 as a ruse to lure him from the temporary living quarters where he was staying during the construction. Investigators suspect that revenge may be a factor in the crime. Lott had been involved in a violent confrontation two days earlier with Luis Pena, of La Madera, New Mexico and Jaime Cruz, also of La Madera. Both men are in their early 40s. The confrontation erupted over the duo’s apparent running over of one of Lott’s dog’s on highway U.S. 64. Lott chased down the duo and words were exchanged culminating in Lott hitting Pena with a baseball bat and breaking his arm. Other incidents may also be a factor. The evening of Lott’s shooting, a woman staying at Lott’s residence stated that about 3 hours earlier that evening a well-spoken man, with blondish, grey hair in an early 1970s tan or yellow colored Ford truck pulled into Lott’s property. He said he was looking for someone named "Louie". Lott sent him on his way informing him that no one by that name lived there. A bit later that evening Lott and his guest noticed the taillights of a truck parked down near the road near the intersection of U.S. 84 and 64. Shortly before midnight, Lott discovered the fire on his property and went out to put it out with a fire extinguisher. As Lott was inside the structure attempting to put out the fire, shots were fired at his home one of which struck him in the head. Rio Arriba County sheriff’s detectives obtained a search warrant to seize the truck of Antonio "Ike" DeVargas, a land-use planner with Rio Arriba County as well as a logger and a political activist. De Vargas is a friend of Pena and owns a truck, which matches the characteristics of the truck seen in the area of Lott’s home. The detectives wanted to check DeVargas’ tires on the truck to see if they matched tracks found on Lott’s property. However, DeVargas changed the tires just prior to the execution of the search warrant. If you or anyone you know has information about this murder we urge you to help. If you have information leading to the arrest and conviction of Sam Lott's MURDERERS, you will receive up to a $1000.00 REWARD from Crimestoppers. Please contact Detectives Johnny or Joe Vigil at (505) 753-3329 email us with any information related to this case no matter how seemingly insignificant. Please click here to see a memorial page for Sam Lott.